A fried cabbage recipe with three easy steps and four ingredients. It’s the perfect side dish for household favorites like corned beef or kielbasa sausage. 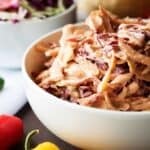 This fried cabbage recipe is a dish that we’ve been wanting to add to the blog for awhile now, but we just haven’t gotten around to it. 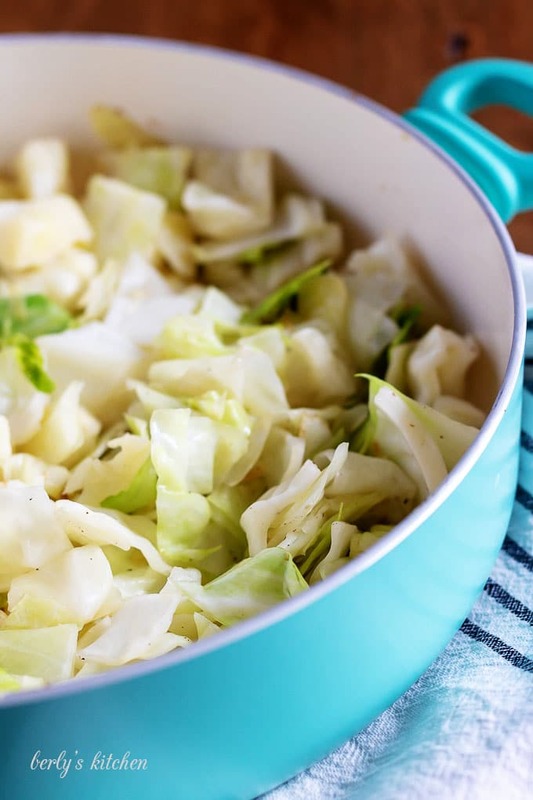 Well, if you’ve ever wondered, “how do you pan fry cabbage?” Then, this post is for you. It’s really easy, and everything comes together in less than an hour. 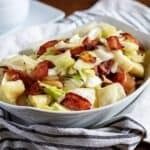 Best of all it only uses four ingredients; bacon, cabbage, onions, and salt/pepper (optional). I know, technically, I suppose it’s five ingredients. But, honestly, who counts salt and pepper separately? Since salt and pepper are optional, I could have said three. But, I digress, my blog is not the place I choose to have debates. If you wish to contact me over it, use the contact us page. Moving on, who doesn’t love bacon? Especially, when vegetables are cooked in the pan drippings. Personally, I can’t think of a better flavoring agent then warm bacon fat. 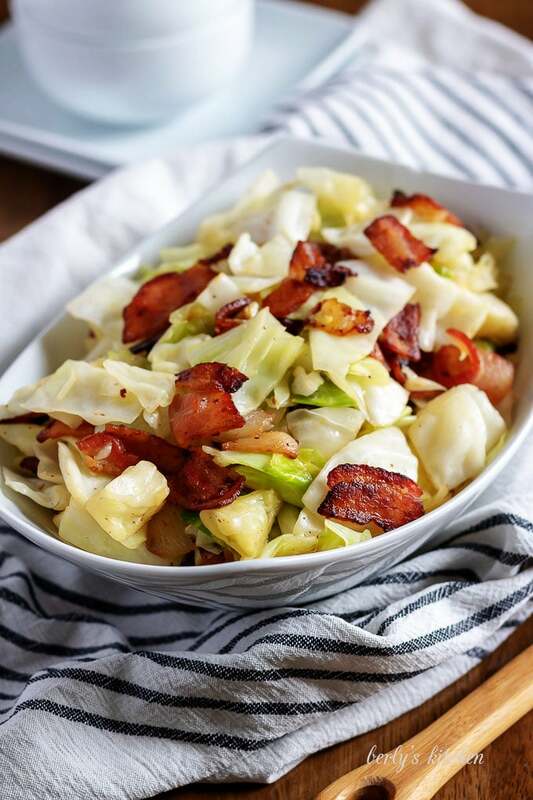 If you’re wondering what you should add to cabbage to flavor it, then the answer is always bacon. In fact, you can use it to flavor broccoli, cabbage, potatoes, the list goes on and on. For today, we’re going to use it on the cabbage. Which, is perfect, because that means no additional fats are needed to pan fry the veggie. My only drawback with this fried cabbage recipe, is how long it takes to cook. In half the time, I can prepare a medley of saute’d seasonal vegetables dressed with a white wine butter sauce. 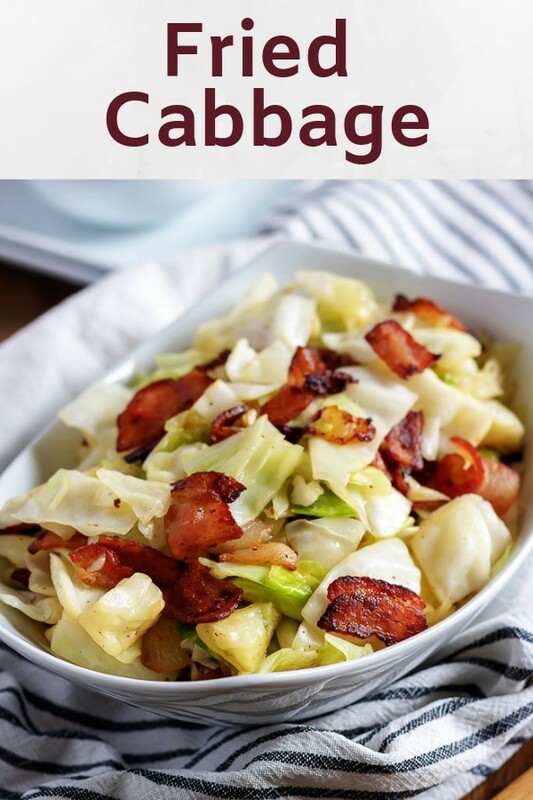 With that being said, if you’re craving a scrumptious cabbage dish, then this one really hits the spot. So, without further adieu, let’s get rolling! To begin, start by prepping all your ingredients. Take your bacon and onions and cut them into 1-inch pieces (pcs.). Afterward, wash and core the head of cabbage. Then, use your knife to cut the head into 1-inch pcs. as well. Next, in a large skillet over medium-low heat, fry your bacon and onions together. As it cooks, you’ll want to use your spatula to stir them. Let everything go for about 15-minutes or until the bacon is nice and crispy. 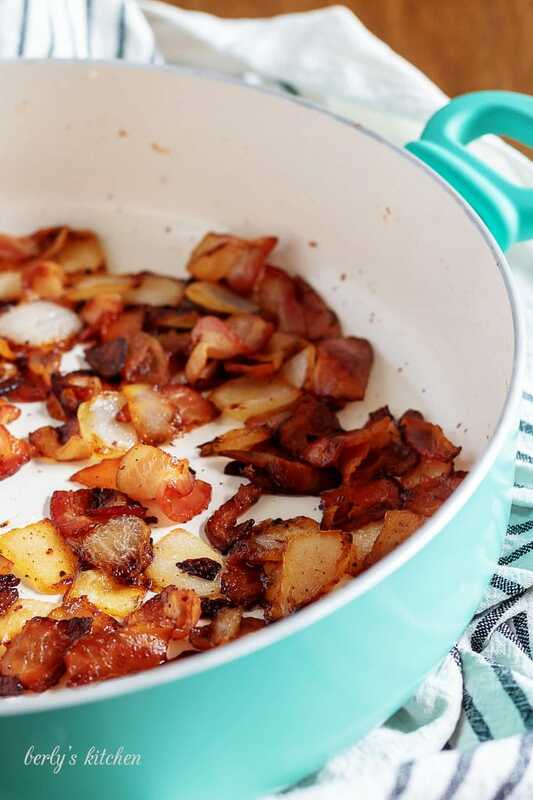 When the bacon and onions have finished cooking, take a slotted spoon and remove them from your pan. However, you want to leave the fat and drippings in the pan because you’re going to use that to fry your cabbage. So, go ahead and dump in the cabbage pcs. They will need to cook for about 20-minutes so that the cabbage has time to wilt from the heat. Last, with the veggie pcs. cooked, turn off the heat and stir the bacon and onions into the cabbage. That’s it your all done. Serve up the dish and enjoy. Or, if you’re making it in advance, the fried cabbage can be stored in your fridge for up to 3-days in a sealed container. An easy way to core a cabbage is to cut it into quarters, then use your knife (at an angle) to score the inside of the head and pop out the pieces of the core. 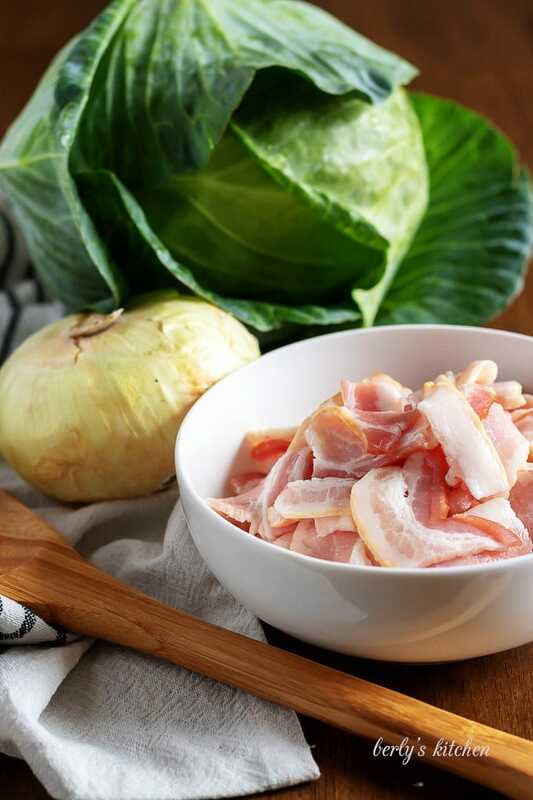 The smoking agent used in the bacon will carry over to the cabbage. For example, if you use a hickory smoked bacon, then expect hints of hickory throughout the dish. This would be the same if you used an apple wood smoked bacon. Just something to keep in mind when purchasing the pork. 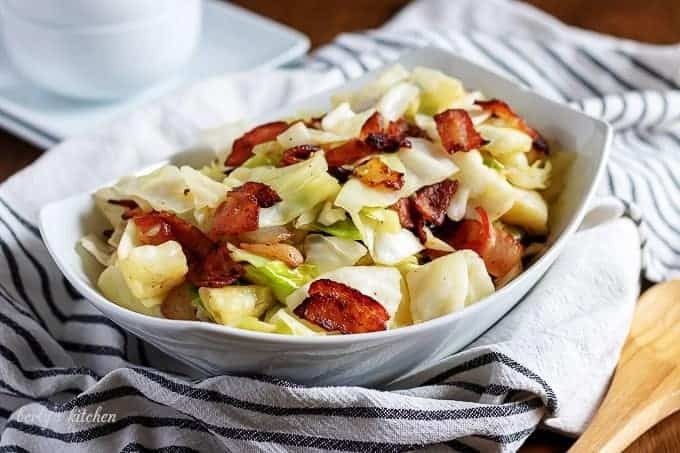 If you don’t want to use bacon and want a vegetarian version of fried cabbage, then omit the meat and use butter or olive oil (based on your preferences). 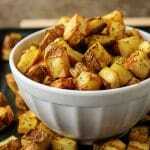 Keep in mind that you may need to add higher amounts salt and pepper for flavoring. Okay, so you like this recipe, but aren’t sure what to serve it with. Well, you can serve fried cabbage with lots of main dishes. As I stated above, corned beef and sausage works well, but don’t forget about ham or even chicken, depending upon what you use as seasonings. For more ideas, do a quick Google search, you’re bound to find something tasty. If you like our fried cabbage recipe, please leave us a comment and rate the recipe card. You can also find us on Facebook, Pinterest, Twitter and Instagram searching for Berly’s Kitchen! A fried cabbage recipe with three easy steps and four ingredients. It's the perfect side dish for household favorites like corned beef or kielbasa sausage. Heat a large skillet over low-medium heat. Add the bacon and onion pieces. Cook, stirring occasionally, until the bacon is crispy and onions have softened. Remove from the pan and drain on a paper towel-lined plate. Add the cabbage to the bacon drippings that remain in the pan. Add salt and pepper if desired. Cook until the cabbage is wilted (about 15-20 minutes) or until the desired texture is reached. Stir occasionally. Turn off the heat, and add the bacon and onions back to the pan. Stir to combine. Serve while hot. The calories listed are an approximation based on the ingredients and a serving size of 1-cup. Actual calories will vary. The fried cabbage can be stored in your fridge, in a sealed container for up to 3-days.